Oshkosh, Wisconsin. 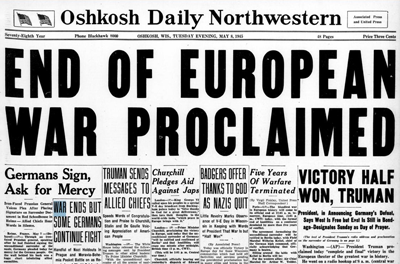 Historic newspaper from the end of World War II, one of over 12,000 newspapers available for purchase. Nearly 2 million items in the Wisconsin Historical Society Library exist on some sort of microform and these represent virtually all the subject areas in which the Library collects. The Library has particularly strong genealogy, labor union, North American exploration, African American and Native American holdings. The Library's collection of newspapers is the second largest in the United States, surpassed only by that of the Library of Congress. Many of the newspapers in the collection are on microfilm. Also on microform is the Library's collection of family history records, including published and microfilmed family histories, church and cemetery records, birth, death and marriage registrations, federal and state census, local histories, and military information covering the United States and Canada. Microfilm holdings can be found by searching the Library Catalog using the blue button below. Wisconsin residents may check out most microforms in person, additionally, most microforms are available to non-Wisconsin residents through interlibrary loan (depending on copyright compliance and/or physical condition) from participating institutions. Note: Some heavily used materials (including genealogical resources) do not circulate. See the "Purchasing Copies" section below to learn how you can buy copies of partial or full microfilm reels. There are multiple options for purchasing copies of microforms. Portions of microfilm may be purchased for a fee as show below. The Society also has a dedicated Microfilm Sales service for those who wish to purchase from their catalog, which includes the option to purchase full reels in addition to single pages or sections. See more information in the links below. Researchers who cannot visit the Library-Archives may order copies by mail, fax or e-mail. We do not accept orders by phone. See the List of Fees. In your request, please be sure to include a specific reference to title, author and page numbers. Please note: Requests that do not include a specific reference to title, author and page numbers will be treated as requests for research assistance. The Library and Archives can only provide limited research service and we reserve the right to turn down research requests on a case-by-case basis. We are experiencing problems with the site. We are working on resolving them and apologize for any inconvenience. 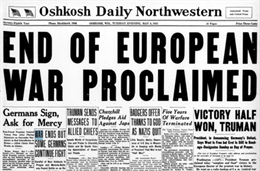 Please email microfilmsales@wisconsinhistory.org for assistance purchasing microfilm or digital microfilm. Each month we add more to our Microfilm Catalog. However, it does not yet contain microfilm of manuscripts, archival collections or monographs.